You can purchase the Kids' Wings 24-page Kids' Wings Unit for The Lightning Thief by Andrea White NOW for immediate download for only $12.95! Have you ever been on a field trip and accidentally (or on purpose) pushed the most disgusting kid in your class in a fountain? And then, did your teacher turn into a hideous monster with long claws like a gargoyle and try to kill you? Well it happened to Percy Jackson! Not only that, but things started going down hill from there! Was every monster in the universe out to kill him? What had he ever done wrong...other than being slightly "different"? It was true Percy couldn't sit still in school. ADHD. He was always in trouble, it seemed, but he did try to keep his odd, best friend, Grover, out of trouble. Do you think Percy would freak out when he learns that he was a half-blood, the son of a Greek god? Well, wouldn't you? Gather your courage and get ready for a modern day romp to Olympus with Percy where you'll come face-to-face with centaurs, satyrs, woodland nymphs, minotaurs, and other creatures along with the Greek gods! After reading The Lightning Thief by Rick Riordan, you will enjoy the movie, The Chronicles of Narnia, even more! When you order our Forever Friendships Collection, you will receive 21 literature guides including The Lightning Thief for less than $.75 each! It's an offer we hope you can't refuse ... while our limited quantities last! A special thanks to Brad White for allowing us to use his awesome Background music "Pavane". Kids Wings highly recommend his recordings available at The Pan-Flute Shop! 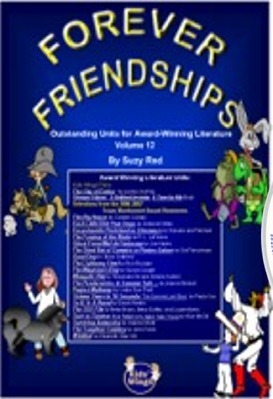 More Award-Winning Books for 2006-2007 are available in Forever Friendships! Other Interdisciplinary Learning Units for Grades 3-7 are now available in our Bookstore! Your purchases through the Kids' Wings Bookstore and Amazon Links help to keep our website doors open! The Texas Bluebonnet AwardSM is a service mark of the Texas Library Association, which is in no way affiliated with Kids' Wings or Suzy Red. Use of the Texas Bluebonnet Award mark in Kids' Wings web pages and/or materials does not imply any endorsement of any kind on behalf of the Texas Library Association. The Texas Bluebonnet Book Master ListSM was selected by the Texas Bluebonnet Award Committee of the Texas Library Association."